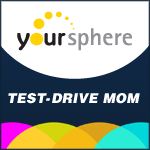 Texas Housewife: We're Loving YourSphere! The kids are really enjoying Yoursphere. I was afraid the "new" would wear off, but that hasn't been the case at all. The past few days they've been checking out OurWorld, the virtual world on Yoursphere. It has an arcade that the kids love to mess around in playing games. Playing games earns you "flow" and helps you level up in game. Both my kids love gaming so this part of your sphere has been a big hit. Not only can they make new friends, but they've been having a lot of fun doing it! I must say, I haven't heard "I'm bored!" even once since they got out of school for summer break. Just a reminder, Yoursphere is completely free to use. If you and your kiddos would like to check it out for yourselves, please sign up with code: YSMC-0049 and let them know Ramblings of a Texas Housewife sent you.